Thought MP4 files are the most universal format for videos today no matter on Mac/Windows or iPhone iPad Android devices, it's absolutely not the time for AVI files to bow out. AVI is still one of the most popular video format supported by all media players. There would be times to convert MP4 to AVI format for playback on Windows media player or AVI compatible mobile devices. In these cases, a MP4 to AVI converter Mac is in demand. Generally, there are two kinds of MP4 converter on marketplace: free and paid. It's hard to say which one is better since there are different situations for each person. But here we will list the best two MP4 to AVI transcoder for Mac of each type. 1. Massive video formats supported. You are able to convert any video audio formats, like MP4 to AVI, MP4 to MOV, MKV to WMV, MP4 to FLV, etc. 2. Multiple preset profiles. This MP4 video processing software offers more than 420 preset profiles for Apple Android devices, including iPhone Xs Max/Xs/XR, iPad Pro, Galaxy S9 edge, etc. 3. Download online videos. More than the best MP4 to AVI converter, this program also allows you to download online videos from YouTube, Facebook and 1000+ sites. 4. Fastest speed & high quality. It delivers superfast speed to convert MP4 to AVI on Mac with minimal quality loss. Aiseesoft MP4 Converter for Mac is the best Mac MP4 to AVI converter that can convert all popular video formats including MP4 to AVI on Mac OS X at super fast conversion speed and with excellent output quality. Meanwhile, with the best MP4 to AVI video converter, you are also free to directly convert MP4 files to AVI compatible media players or mobile devices. It doesn't support El Capitan. At the mention of free MP4 to AVI converter, MacX Free MP4 Video Converter comes to my mind firstly. It supports converting MP4 files to any video formats, like MP4 to AVI, MP4 to MOV, MP4 to FLV, etc. Strictly speaking, this free MP4 video transcoder for Mac is the lower version of MacX Video Converter Pro. Thus it may lack some salient features compared with the advanced edition, like speed and limited formats supported, unavailable on Mac El Capitan etc. 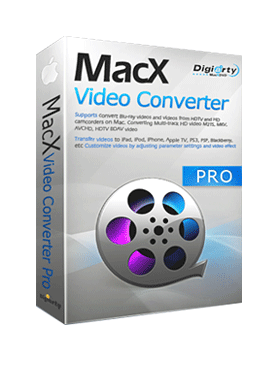 But anyway, it's enough for simple converting MP4 videos as a free Mac MP4 converter. 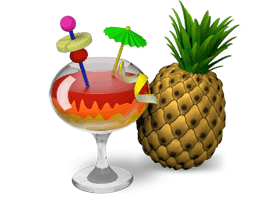 Handbrake may be the most famous free MP4 video converter to convert MP4 to AVI on Mac or Windows. This freeware has no problem in both speed and quality when you use Handbrake convert MP4 files to AVI. However, you should note that the AVI output codec is available only for older version (0.9.2. or earlier), but for Handbrake 0.9.3 or above it shall be a little tricky to convert MP4 files to AVI format as AVI container and codec are dropped. But unfortunately Handbrake is not omnipotent cuz it's unavailable to run on Mac OS X El Capitan or macOS Sierra. 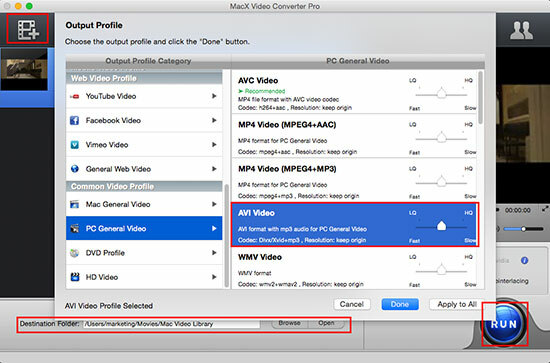 If you're using the newer version, you can switch to other free MP4 to AVI converters for Mac like MPEG Streamclip. Step 1: Free download MP4 video decoder on macOS or Windows version and launch it. Click "+" button to load your MP4 files. Step 2: Choose "AVI" as the output format from the automatically popped up window. Or you are also recommended to choose the AVI files compatible devices or media players to output your video. Step 3:　Click "Browse" button to specify the output folder path to save the converted AVI files from MP4. Step 4: Hit "RUN" button to start the short journey of MP4 to AVI conversion. Well, all of the MP4 to AVI video converter softwares are compatible on Windows PCs as well. That is to say, if you are a Windows (Windows 10 incl.) user, you are also capable of converting MP4 to AVI files with the excellent apps above. And it's totally up to your choice for the free or paid MP4 to AVI converter for Mac/Windows. If free one can meets your needs well, just go ahead. 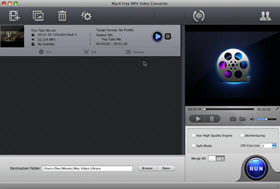 Or else the paid MP4 video converter like MacX Video Converter Pro can be the preferred option. Convert MP4 to AVI Fast with Top Quality!